Now on the Braves, Shelby Miller is using his cutter to help him reach heights he was never able to reach with the Cardinals. Just three years ago it would have been unthinkable for the Cardinals to send Shelby Miller packing, especially with four years of team control remaining. Miller was a top prospect from the moment the Cardinals selected him with the 19th pick in the 2009 amateur draft, and halfway through his rookie season he appeared poised to be the next great frontline starter in St. Louis. Everything proceeded to fall apart for him in the second half, culminating in his playoff exile— he made one relief appearance, despite the Cardinals going to the World Series and his presence in the rotation all season. Miller never seemed to recover his confidence, struggling through a sophomore season in which he amassed a 4.54 FIP and was worth 0.5 fWAR, essentially making him a replacement-level pitcher. The Cardinals have a reputation for being the national headquarters of the pitching reclamation project, even though their own Dr. Frankenstein, Dave Duncan, is no longer the pitching coach. In this case, they let a pitcher get away, sending Miller to Atlanta for Jason Heyward during the offseason. Through the first five weeks of the season, it appears the Braves have launched a successful reclamation project of their own, teasing out of Miller the frontline ability that the Cardinals believed was non-existent or, at the very least, dormant. Miller has made seven starts for the Braves thus far this season, going 4-1 with a 1.60 ERA, 0.93 WHIP and 39 strikeouts in 45 innings. His FIP is up at 3.41, and he has been the beneficiary of a .203 BABIP and 87.9% strand rate, but there’s no way to say that Miller is skating by on the thin blades of luck. Miller’s getting a ground-ball rate near 50% this season and has cut both his homers allowed per nine innings and his HR/FB ratio. He can still struggle with his control from time to time, but all you need to do is watch him to see that he’s a fundamentally different pitcher, even from the one who finished third in the NL Rookie of the Year voting in 2013. Miller owes his success largely to one change: the increased usage, and command, of his cutter. Before this season, Miller only dabbled in the cutter. Last year, he threw it 6.38% of the time, and the season before he tossed it even less. This year, he’s throwing it more than one-fifth of the time. Below is a table of his pitch usage by year, courtesy of Brooks Baseball. You can also see in that table that Miller is throwing his sinker far more often this year, while halving his four-seam fastball usage. It’s the cutter, however, that is driving his success. Opposing batters are hitting just .079 with a .105 slugging percentage against the cutter. The pitch also carries a 15.67% whiff rate, and is responsible for 14 of Miller’s 39 strikeouts. 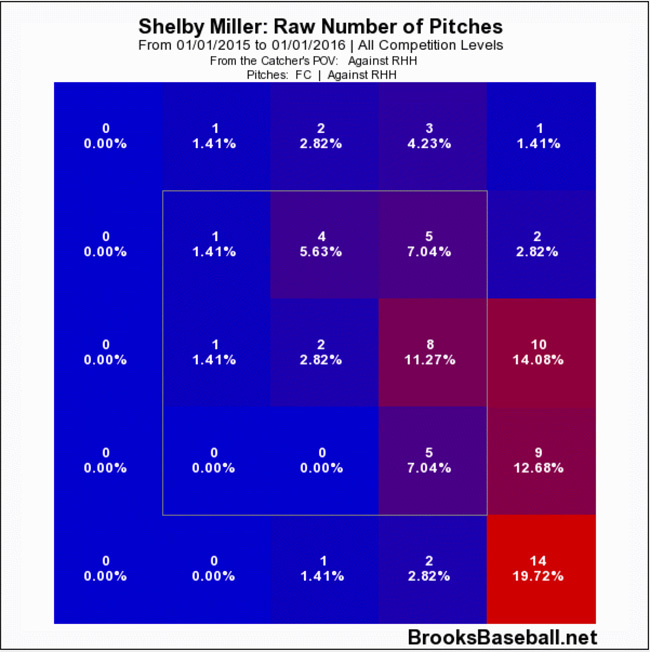 How good is Miller’s whiff rate for a cutter? Well, Brooks Baseball’s data goes back to 2007, and in that time, Mariano Rivera, patron saint of the cut fastball, never had a whiff rate better than 14.88 on the pitch. Miller’s cutter features an unforgiving combination of speed and movement. Before this season, Miller’s repertoire was essentially made up of a four-seam fastball and a curveball. He threw the cutter, sinker and change, but none more than 6.5% of the time. The cutter basically gives him the tight breaking pitch he never had and that can be weapon to both righties on lefties on both sides of the plate. According to Pitch F/X data, he’s getting 1.12 inches of horizontal movement on the pitch. That compares favorably with cutter maven Madison Bumgarner, whose cutter, seen as one of the best in the league, is getting 1.02 inches of horizontal movement this year. Let’s take a look at Miller’s cutter in action this season. He had another great start on Monday, allowing one run on three hits and two walks to the Reds in seven innings, striking out eight and taking a no-decision. He threw the cutter 20 times in the outing. Of those 20 pitches, six were called strikes, five were swinging strikes, four were foul balls, two were put in play for outs, and one resulted in a single. The other two were taken for balls. The Reds did absolutely no damage against Miller’s cutter and came up empty one-fourth of the time he threw it, or five of the 12 times they swung at it. Todd Frazier’s at-bat in the sixth inning contributed one swinging strike and one taken strike. I’ll spoil the result for you right away and let you know that Miller fanned Frazier looking. Frazier, of course, has been one of the Reds’ best hitters this year, belting 10 homers and compiling a .533 slugging percentage, .859 OPS and .369 wOBA. Miller, nearly six innings and 75-plus pitches into his night, dispatches of Frazier with four pitches. The first pitch of the at-bat was a 94 mph four-seam fastball that Frazier took down for ball one. Miller then came back with this gem of a cutter that he spotted perfectly on the outside edge. By the time Frazier identifies the pitch as a cutter and tries to hold up, he has already committed to swinging. The result is an even count at 1-1. Miller comes back with a sinker in on Frazier’s hands that he fouls off weakly toward third base. With the count in his favor, Miller comes back to the cutter. Frazier takes this one right on the outside corner for strike three. The beauty of both of those offerings wasn’t just in the pitch itself, but in Miller’s command. That he’s not afraid to throw the pitch whether he’s behind or ahead in the count speaks to his confidence in it, and the way he placed both right where he wanted them, away where Frazier couldn’t do any damage, is a microcosm of how Miller has become a ruthlessly effective pitcher this year. The following is a zone profile for all the cutters Miller has thrown this season. Notice how nearly all of them are on the corners, or off the plate. No matter if he’s facing a lefty or a righty, Miller wants to throw the pitch away. That means he’s backdooring lefties with the pitch, while getting an effect similar to a slider tailing away from a right-handed hitter. As you can see from the zone profiles below specifically against lefties (first) and righties (second), he couldn’t be doing much better by walking to the plate and placing the ball in the catcher’s mitt. Shelby Miller was always supposed to be a frontline starter. It didn’t happen for him in St. Louis, and the usually prudent Cardinals shipped him out of town, despite him being under team control through the 2018 season. With Jason Heyward slashing .259/.312/.371 and Miller using his newfound cutter to reach the heights foreseen during his prospect days, they very well may be regretting that trade. Any fantasy owner who bought in at Miller’s depressed draft-day price, however, can bask in his reflected glory.